Get out your tuxes and J Lo dresses everyone! It’s time to hand out hardware! While the gang is out roasting in international waters, we here at the Roast Report strive to bring you the battle content you’ve come to expect. First things first…we have new ranks! A lot of movement on both lists. The biggest leap had Olivia Grace (4-0, 3) skyrocketing to top three and Jerron Horton (4-3, 9) entering the top 10. Joe Dosch (6-1, 1), despite a loss, remained the top ranked battler while Ashley Barnhill (6-1, 4) fell in the standings for the first time in her career as a roaster. Meanwhile our Headliner Ranks are growing! Sarah Tiana (4-0, 1HR) has taken her place as the Ice Queen of the Comedy Store. Best of luck to Ashley, Sarah, Tony, Joe and the rest of the battlers this week in Montreal! And now…we’ve got eight categories chosen and deliberated upon by The Committee. I now present them to you all! Please hit me up! Hit up Jay Light (6-3, 7)! 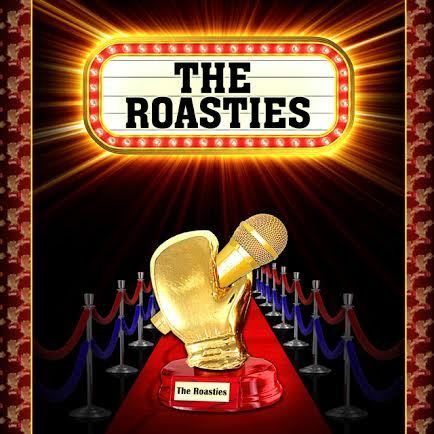 Shoot @roastbattle a tweet! I will tally anything anyone tells us and release the results by Friday, hopefully. To appreciate the best, we must first acknowledge the worst. As a battler, the words you want to hear the least from Moses are “this isn’t easy”. Here are the nominees for Worst of the Year. Stacked category. Matt Lewis (0-1, last), you’ll remember, had the worst string of twelve jokes anyone has ever assembled. His zero of a performance against Pete C got him banned from The Comedy Store. Scott Kidd (1-91, 120), while earnest in attempt, has never really impressed in a single battle. Phenom Brown was so bad she was walked off-stage in the middle of her battle, with Coach Tea playing TAPS. Finally, Jon Haber (0-0, 116) vs Jared Rudolph (0-0, 117) was the worst thing I’ve ever seen on a stage not named Matt Lewis. Good luck men! Every good meal at a restaurant requires an appetizer for you entree. It can leave a bitter taste in your mouth or can make you hungry for more. Here are the nominees for Best Undercard. Sean (1-0, 43) vs Matt (0-1, 78) was two friends going head to head and nearly making out. That’s the kind of love we’re looking to roast over here. Their battle, like Teddy (0-0, 113) vs Justin (0-0, 114), was nonstop laughs and energy throughout. To win this award, the Undercard must have been an impressive showing from both Battlers. MJB (0-1, 93) vs Keith (1-1, 46) was our Special Olympics Battle. MJB nearly won with his wild energy and weird hand. Keith shut it down, however, and used that momentum to nearly beat Ashley Barnhill! Liz (1-0, 59) and Leah (0-1, 79) lived up to that requirement and then some. The Great Photog felt compelled to mention that this was one of the best he’s seen. It’s hard not to think of Wub (1-1, 51) as the favorite here. His destruction of Brandon Brickz was one of the hottest performances of the year. Joey (1-0, 44) and Sean both had impressive wins. Doug (3-0, 13) and Olivia are the only ones on this list to follow up solid starts with more wins. We’re all just a bunch of kids out here on a playground, trading digs and zings. Nothing moved the playground or moves the Belly Room more than a good ol’ fashioned return volley. Here are the nominees for Comeback of the Year. It’s hard to do justice to any of these in print. These could be Joke of the Night nominees on any night. They needed their own category. In Doug’s case it was his first joke and it set the tone for the rest of the battle, which he won. Olivia’s comeback pretty much dethroned Ashley (6-1, 5). Olivia seems to have had the most practice defending herself. One of the best parts about the Roast Battle is that it takes place inside one of the best comedy clubs in the world; the Comedy Store. Anywhere from 30-50 run through the halls on a given night and #OnATuesday we get a few of them to judge the jokes and roast a few people themselves. Here are the nominees for Judge of the Year. Woo, we’ve reached the Big Three of the awards ceremony! A show that contains a Battle of the Year doesn’t happen to often. Both battlers need to impress. The judges play a factor. All of our nominess recieved ? ? ? ? ? / ? ? ? ? ? on the FE scale with the exception of Mike Lawrence (1-0-1, 5HR) vs Annie Lederman (1-0-1, 8HR). That was a draw and draws are wack af but we all know who should have scooped that W.
Congrats to Frank Castillo for making two appearances on this list! Connor (2-2, 26) vs Keith (4-1, 12) was hot fire the whole way through. We all remember where we were when Joe (6-2, 1) overcame Alex (7-1, 2) (the Belly Room). This is a big one. We have 121 battlers from California to Texas to New York. We’ve had a show a week, save for two, since the Report was born in mid-February. These six battlers have not only won but won big, impressing crowds and judges alike. Here are the nominees for Battler of the Year. Oh man is that a powerhouse list. Frank and Olivia both have multiple nominations. 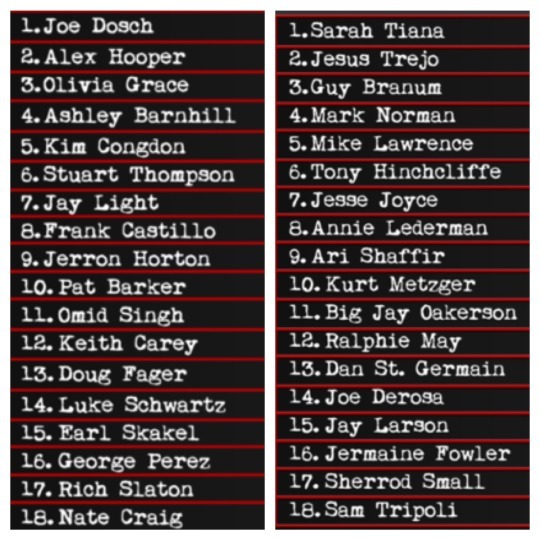 Joe is the current queen king of the non-headliner ranks. Jay Light is not only a great battler but along with Frank serves on the Roast Battle Advisory Board, ensuring the quality of the show. Ashley owns the longest win streak in the show’s history at 6-0 and has battled in Texas and Canada. Keith is a mainstay at the haters table and barely has a loss on his record. Which came at the hands of Omid Singh (5-3, 11), fellow hater and excellent battler. Really looking forward to who everyone sides with for this award. This is my friends, is the whole concept of the show. The roast joke itself. In my eyes, this award is the crown jewel of The Roasties. We’re all joke-writers here and this award is for the best single joke told on the Roast Battle stage. All of these were original, creative jokes that were personal and specific. And not to mention absolutely hilarious. If you’ve ever seen the show or read the report, we need and want you to vote. Ill give it till Friday. Lmk bruh.